Bottleworks changed the layout of their store last summer to add five taps, a bar, and a large table with stools and plenty of room to stand. Since then, I’m sure many of you have enjoyed a pint of something while browsing through their selections. 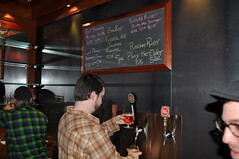 This Thursday, they will unveil four additional taps, bringing their total beers on tap to nine. To celebrate the added keg space, they’ll be having an impromptu gathering on Thursday evening. There will be discounts on growler fills from 5pm to 9pm, and there may be some things on tap you will be sad to miss. They won’t give any specifics, but Shaughn my friend the Beer Retard says these special beers “should cause some excitement for local beer geeks”. In addition, there may even be some pizza to soak up that second (or third) pint of beer. I caught this tip while on assignment as a reporter for SBN and should set the record straight. Shaughn didn’t actually say that line about the special beers causing excitement among local beer geeks. That was me paraphrasing the Bottleworks response to my question about what the four beers would be. Tremendous. Anyone for a beer hike? Park Pub, Bottleworks, maybe Fremont Brewing if they’re still open, then Brouwer’s. Park Pub, Naked City… whatever. Mr. UBH–my plan was to hit Fremont at 4 for some Solstice and then hoof on to Bottleworks. But continuing on after BW to Phinney and Greenwood for more beer would be really out of character for me. I heard the hours are being extended on the weekends as well.